“Want to go to a Jazz night” said Colin, “Yes” I said not really listening to the details and into the diary went ‘Jazz night’ for the 23rd November. It was freezing on the night and so, imagining some sort of smokey, dimly lit, fridge like basement with not much heating, I dressed up nice and warm with a good few layers and we headed out. My eyes lit up when I saw the venue because it immediately screamed ‘heating’ at me and meant I’d be warm even if I didn’t like the Jazz. 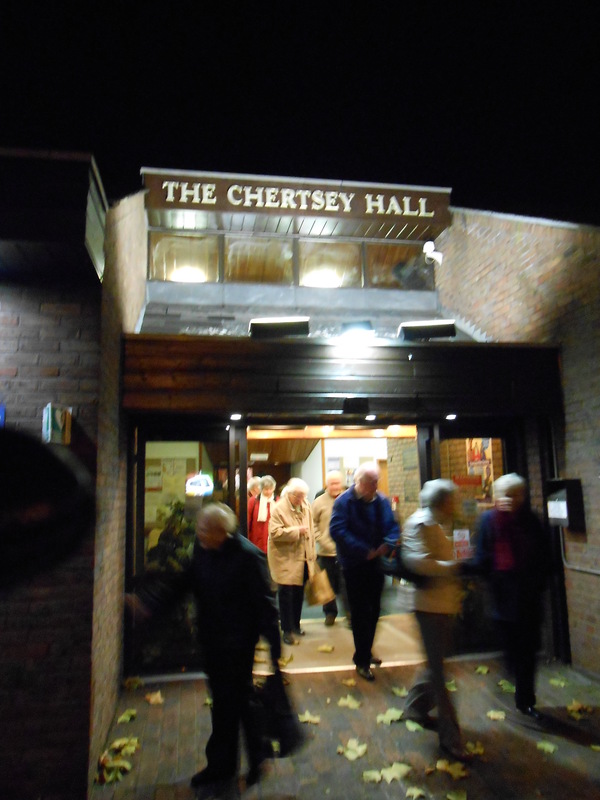 All thoughts of a hip and trendy 60′s style Jazz club scenario went out the window as we entered The Chertsey Hall which was brightly lit, warm and had a lady selling homemade scarves, snoods and hats in the foyer. We’d been invited by a couple of members and so we paid the non members rate of £10 each to go in. Once in the building I noticed that Colin and I had brought the average age down quite considerably which was exactly what our host said as we walked through the door. 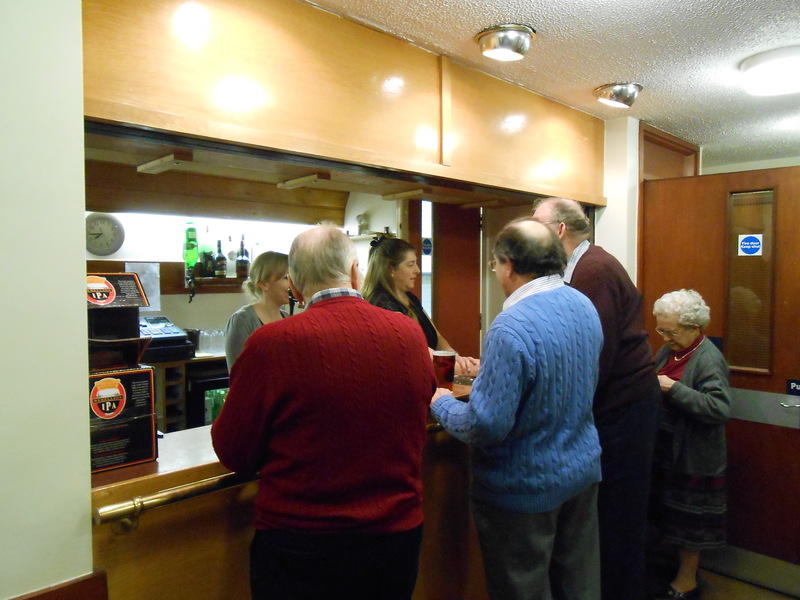 However, these silver Jazz lovers looked a lively bunch to me, the place was heaving and the bar was open. We went straight to the bar to order our bottle of wine, the bar was small but manned by two very friendly barmaids who, when we ordered a bottle of red wine gave us a choice of Merlot, Malbec or Pinot Noir, we couldn’t make up our mind so asked what countries they were from, we went for the Italian wine, which went down very well with a couple of the Neapolitan love songs we heard later. Out of the bar and onto the raffle station where everyone without exception seemed to stop to buy raffle tickets. The raffle ticket lady was very friendly and was chatting to everyone as they bought their tickets, she obviously knew a good few of the regulars and helped me find the chairman so I could ask if I could take pictures. We finally settled at our table and waited for the show to begin. The Chairman of the Jazz Club did the introductions, tonight we were going to be entertained by Roger Marks and Chris Walker and their tribute to Trad Jazz. On to the tinselled stage came six musicians, a Trombonist, Trumpeter, Double Bass player, Banjo player, Clarinettist and Drummer; all of whom were wearing matching sea green jackets, Glen Miller style. 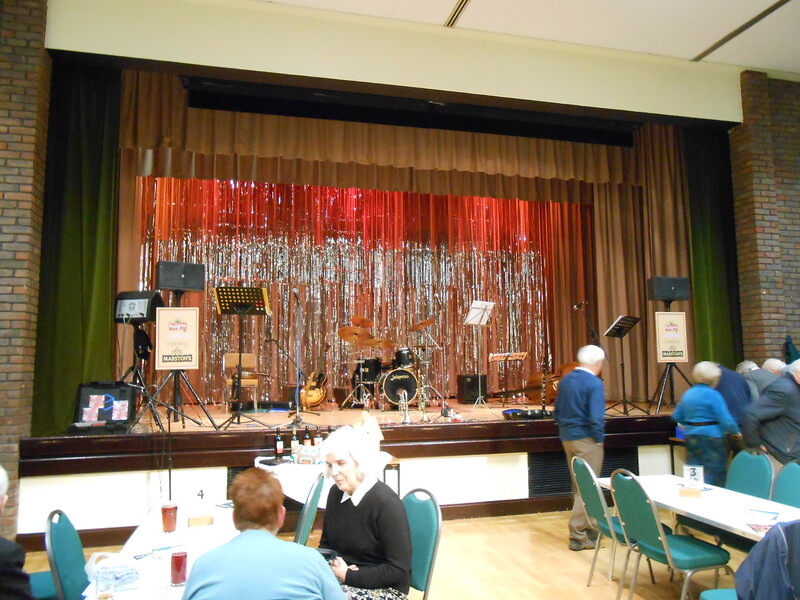 We then sat back and listened while the Band played a repertoire influenced by Jazz greats such as Monty Sunshine, Aka Bilk, Kenny Ball and Hoagie Carmichael. Some of the Jazz, to me, seemed to step right out of a Great Gatsby film and evoked the 20′s and 30′s . Other numbers were more recent, only 40 or 50 years old. 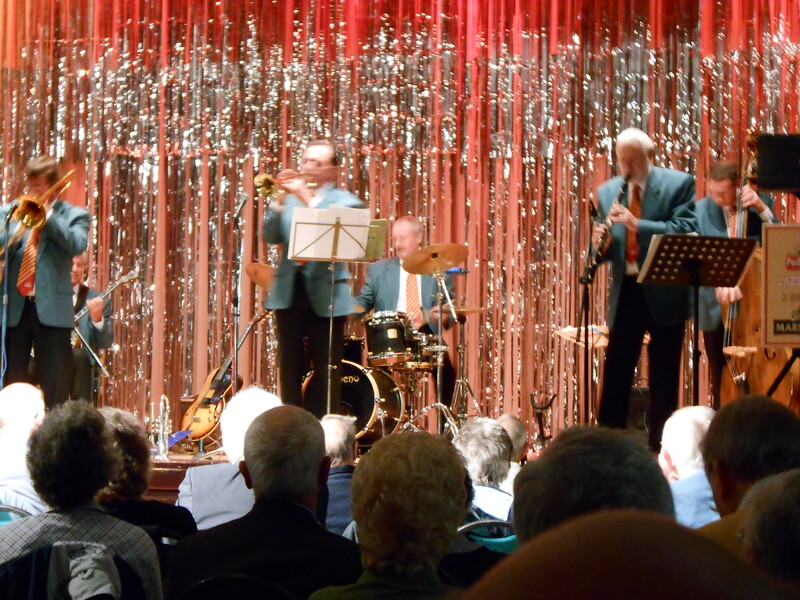 In between numbers the band took it in turns to introduce the next number with frequent references to the ‘Hit Parade’ in the 50s and 60s interspersed with some wonderful ‘awful’ jokes that Bruce Forsyth would have been proud of. My favourite in the first half was when the Band, in a self-deprecating manner said that they were the “best musicians in their price range”. The music was certainly foot tappingly good. I looked behind me and saw a row of ladies all with their arms firmly crossed rigorously nodding their heads in time to the music, others were tapping on tables and chair backs and there was a fair bit of ”chair bopping” going on which probably meant that they would have liked to get up and twinkle their toes on the dance floor. One of the songs, Somerset, by Aka Bilk was introduced as hitting number 5 in the hit parade in 1960, I couldn’t imagine something so charming even hitting the top 40 today which to my mind is a little bit of a shame, but, heh, we gotta move with the times. At half time Brian Frith, the Chairman read out a few notices and announced the Xmas Concert with the Hugh Rainey Jazz band. I went to the bar and had a chat with the regulars. They all seemed to have been coming to the Jazz Club for years and explained that the club was so popular that musicians from all over the country were queuing up to appear at the club ( they are now booking for 2015). The Club is held every month and is often sold out so booking is essential if you want to be sure of a table. I’d say there were at least 150 people there on this particular night. Everyone I spoke to was friendly, had a great love of Jazz and were particularly enthusiastic about the Jazz club. Back to the table for our picnic. You don’t have to pay inflated prices for food at the club you just bring your own, a nice touch. We tucked into french bread, cheese and pate care of Morrisons and washed it down with our Italian wine, delicious! The Raffle was also called out and we won twice!! 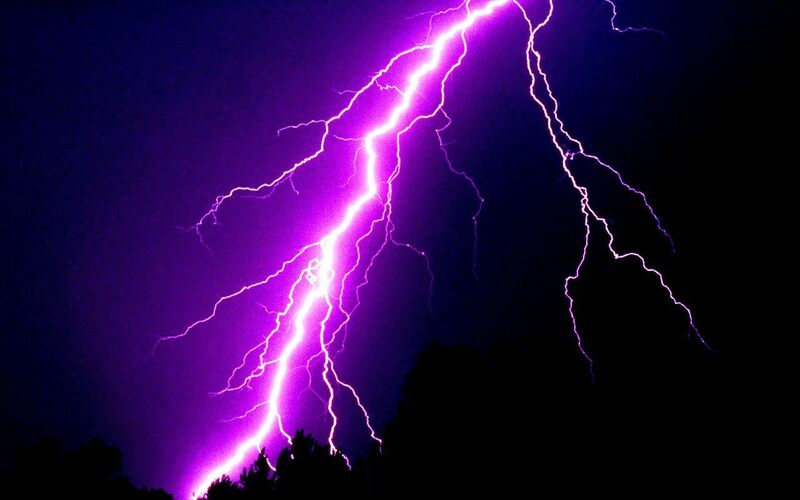 .. beginners luck. I was going to go for the wine but I spotted a brightly coloured home-made, crocheted blanket and couldn’t resist, Colin didn’t like it but I thought it had some nice colours and someone had spent a lot of time on it. The people behind us told me that an 87-year-old lady had made it so I felt justified in my choice and promised it would go to a good home…. probably in a nice cupboard if Colin has his way. The second half kicked off with a little number called ”so do I” with everyone joining in the chorus. The drummer who had been entertaining me all evening with his shoulder rolling and facial expressions also happened to be a Clarinettist and came forward to give a fantastic rendition of Petit Fleur. They did their own version of the White Cliffs of Dover, the audience groaned when it was announced and the band retorted with ‘just you wait and see’ ….I think the audience were right. My favourite awful joke of the second half referred to a little number by Chris Barker entitled “The World is waiting for the Sunrise” AKA by the musical fraternity, ”The Musician is Waiting for a Pay Rise”. 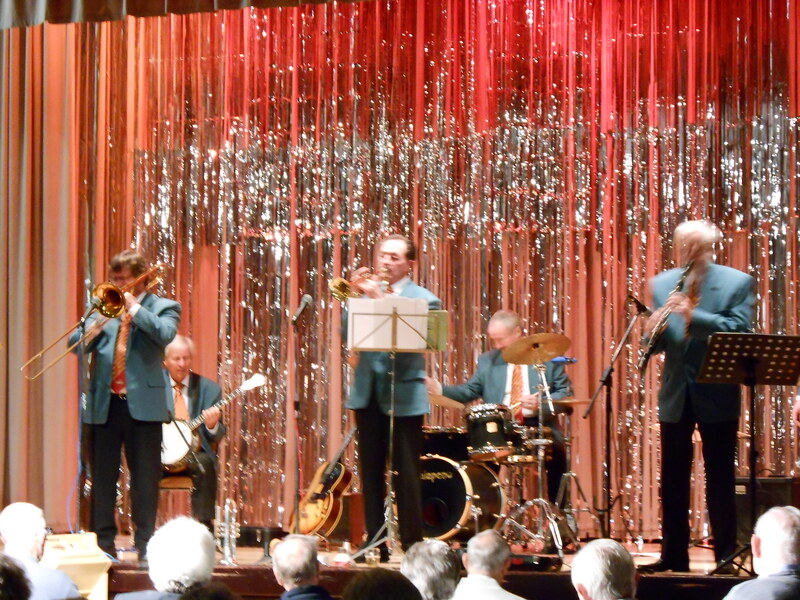 Finally they finished off with a well-known number of Chris Barber’s called Ice Cream, the audience loved it and it was a great way to end the session. We thoroughly enjoyed our evening and will definitely be back next year. 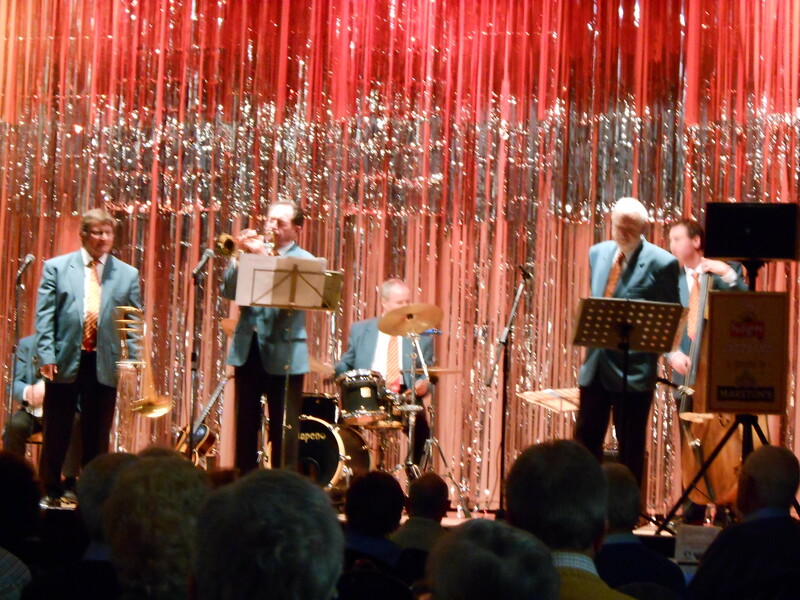 The club is one of the largest Jazz clubs in the country but they still want members. They now have a website under the umbrella of Surrey Community Information website. 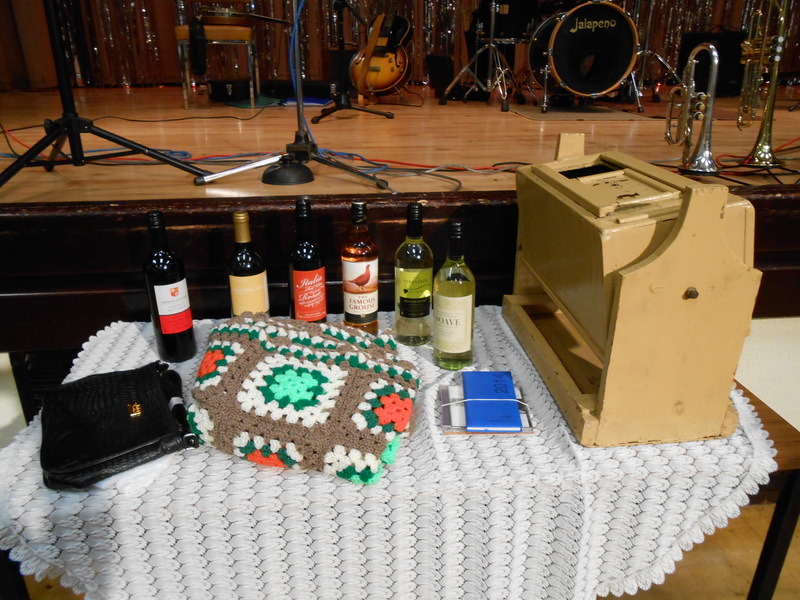 Go to http://www.surreycommunity.info/ and type in Runnymede Jazz in the search box. So get in touch if you’d like to join. 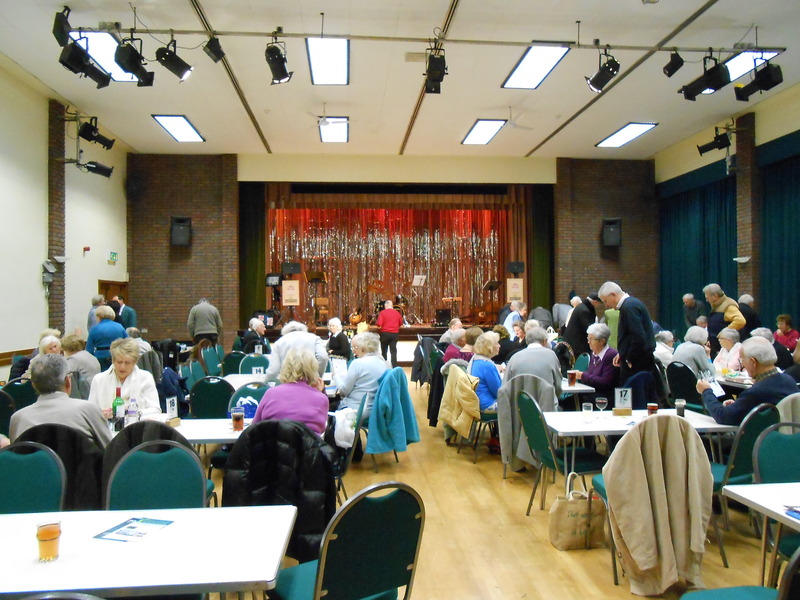 I’m going to give the Runnymede Jazz Club a one thunderbolt rating, it was good but our hosts insisted that we hadn’t seen the best of the club yet. They’d had a band on last month called Reeds United that were absolutely brilliant and had got a standing ovation. I’m coming back when they are on and I’m bringing my mum !